China's energy risk grows with reliance on Xinjiang. The sun rises over the Tazhong oilfield in China's Xinjiang Uyghur Autonomous Region, Oct. 12, 2006. BOSTON—China's growing energy reliance on Xinjiang has raised risks for China's government as it tries to control unrest in the far northwestern region, experts say. The outbreak of deadly riots in Urumqi on July 5 has been linked to the killing of two Uyghur migrant workers in an ethnic attack at a toy factory in southern Guangdong province June 26. But the violence also follows years of tension over the government's "Develop the West" program, focusing on Xinjiang's energy resources and strategic links to Central Asia. Projects such as the massive West-to-East gas pipeline have brought waves of Han workers to thinly-settled Xinjiang since 2000, when former President Jiang Zemin launched the investment policy for western provinces and autonomous regions. 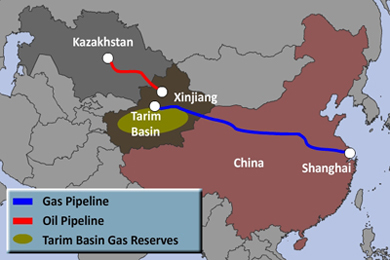 Xinjiang's gas has been tapped to fuel distant Shanghai since the 4,000-km (2,500-mile) pipeline opened in 2004. A second West-to-East project is under way to bring gas from Turkmenistan on a 7,000-km route through Xinjiang to China's East coast. Oil has also been flowing across Xinjiang through a 1,000-km pipeline from Kazakhstan since 2005. In addition to the energy funneled through Xinjiang, China has been exploiting the region for its own resources. Xinjiang contains gas reserves of 1.4 trillion cubic meters, more than any other region or province, the official China Daily reported in February. Gas production from Xinjiang's Tarim Basin field accounted for more than a fifth of China's total output last year. In 2008, the region produced 27.4 million tons of oil (550,000 barrels per day), or over 14 percent of China's output, making it the country's second-biggest oil center. Xinjiang also has 40 percent of China's coal reserves, the official Xinhua news agency reported. The region has at least 11 rail projects in progress and 3.5 billion yuan ($512 million) in highway work scheduled this year. These broad energy and investment interests have heightened the Chinese government's determination to suppress Uyghur autonomy in Xinjiang, said S. Frederick Starr, chairman of the Central Asia-Caucasus Institute at the Washington-based Johns Hopkins University's School of Advanced International Studies. "This is one of the true red lines of Chinese policy, as much as Taiwan, and it's certainly of more strategic importance to them than Tibet," Starr told Radio Free Asia. "This is the case not only because of the resources—oil and gas and other resources—of Xinjiang itself, but also because it's a transit point for energy from the West." Starr said that Uyghur citizens are aware that the benefits of energy development are distributed very differently in neighboring Kazakhstan since the breakup of the Soviet Union. "The money is going to the new Kazakh state and its people. It's not going off to Moscow anymore," Starr said. By contrast, the mostly-Muslim Uyghurs of Xinjiang see little of the region's energy wealth. And the unequal distribution of Xinjiang's energy benefits has deepened Uyghur resentment and raised resistance to exploitation by Beijing, said Starr. "This is not going to be dealt with simply with the fist, as the Chinese have so far tried to do," he said. Robert Ebel, senior adviser to the energy and national security program at the Center for Strategic and International Studies in Washington, agrees that the government's "Develop the West" plan could turn into a vulnerability if it increases China's reliance on Xinjiang energy and transit routes. "That's going to raise the stakes to make sure that the region is kept quiet and keep the people from going out into the streets whenever they think they have a reason to do so," Ebel said. China is also developing a variety of energy import routes from Russia and southeast Asia, reducing the risk of a strategic crisis with energy supplies over time, Ebel said. But the long stretches of pipeline through Xinjiang's vast mountains and deserts would be impossible to protect if they become targets. "You cannot protect a pipeline along its entire length," Ebel said, though he believes China will try to minimize the risk of disruption by threatening harsh punishments. Starr said the best course for Beijing to protect its energy investments in Xinjiang would be to address Uyghur complaints. "The easiest thing for the Chinese to do would be to acknowledge that they're not dealing with separatists, they're not dealing with Islamic extremists," he said. Granting true autonomy to Xinjiang in keeping with its designation as the Xinjiang Uyghur Autonomous Region, first made by former Chairman Mao Zedong, would likely satisfy the demands of the majority of Uyghurs, Starr argued. "It would guarantee the security of energy transit through the region and the extraction industries including oil and gas that are based there," he said. Starr said that Uyghurs' main complaints are that they do not have enough voice in government, feel outnumbered by incoming Han Chinese and do not get a fair share of the region's wealth. "If China addresses [these complaints], it will increase its energy security, not decrease it," Starr said. Callers to RFA hotlines talk about the deadly ethnic clashes in Urumqi, and the government's response.